The New Year brings great news for Oceania football fans as the finalised OFC Champions League match schedule is revealed. 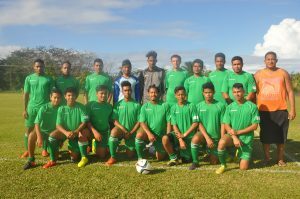 Group A in Vanuatu will kick things off with the winner of this month’s OFC Champions League Qualifier opening the Group Stage against Papua New Guinea club champions Lae City Dwellers before the host club and competition newcomers Nalkutan FC take on Fiji veterans Ba FC on 10 February at Korman Stadium in Port Vila. Group B gets underway on 10 February (11 February NZT) also, with Stade Pater gearing up to host a group for the second season in-a-row. The opening match in Tahiti has Vanautu side Erakor Golden Star taking on Solomon Warriors before the Francophone match-up between AS Dragon and AS Lossi kicks off at 9pm. Groups C and D take place from 25 February to the 4 March – with both 2017 finalists Auckland City FC and Team Wellington bounding into action in Auckland and Honiara respectively. The OFC Champions League Quarter-Finals will be held the 7-8 April followed by the Semi-Finals which will be held across two weekend – the 21-22 and the 28-29 April. 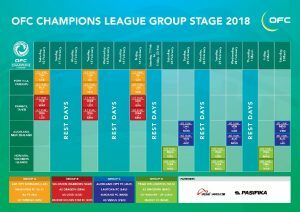 The two-leg OFC Champions League Final will also play out over two weekends starting the 12-13 May and concluding a week later over the 19-20 May. The OFC Champions League is the region’s premier international club competition with the winner taking the title of Oceania champions, along with tickets to the annual FIFA Club World Cup. The competition gets underway in American Samoa later this month with the four club champions from the host nation, Samoa, Tonga and Cook Island vying for the two remaining places in the Group Stage.